The machines in the DLM series have solved the above-mentioned problems. We shall list and describe the main features with the following brief notes. The DLM -03 serious (Figure 10) is designed with the pivoting balancing beam, which compensates the weight of the machine head (Figure 9), similar to weighing scales or a construction crane. This prevents rearing up due to the respective counter-forces. The quick and considerable vertical adjustments are carried out with a pneumatic or electro-mechanical vertical slide (Z- axis), and the precision in the range of 0.2 mm is sufficient. The adjustments are based on an adjustable stop or a travel-measuring system. The precision in-feed is carried out by precisely tilting the balance beam. The slight shift in the fulcrum that this causes has no effect. The zero setting is reached when the upper working wheel is positioned on the lower working wheel. The working spindle is mounted permanently and need not be shifted vertically. This makes the torque transfer extremely simple. The in-feed of the various loads is simple and can be controlled precisely. This results in an entirely new level of precision. A self-locking function (securing) of the upper working wheel prevents any risk of danger in the case of a power failure. The machine head automatically pivots away laterally thanks to a pivot bearing in the machine head. 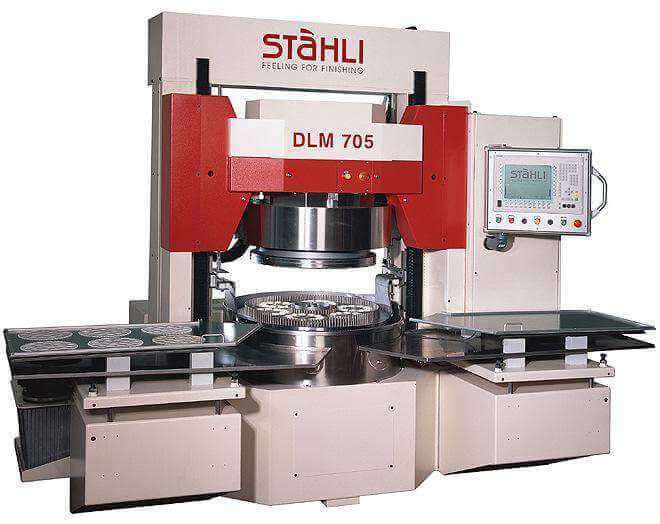 The DLM -05 series is the ideal flathoning machine and features a portal design. This gives the machine an extremely stable force progression and also an excellent contact-force dynamic. With its contemporary hydraulics, force sensors and corresponding algorithms, the contact force can be applied extremely dynamically, and so can be adjusted to suit the machine process. This series is also characterized by the fact that it is produced in steel/polymer from a single mold. This guarantees excellent internal damping while keeping costs low. The working area is compact and is designed for user efficiency. 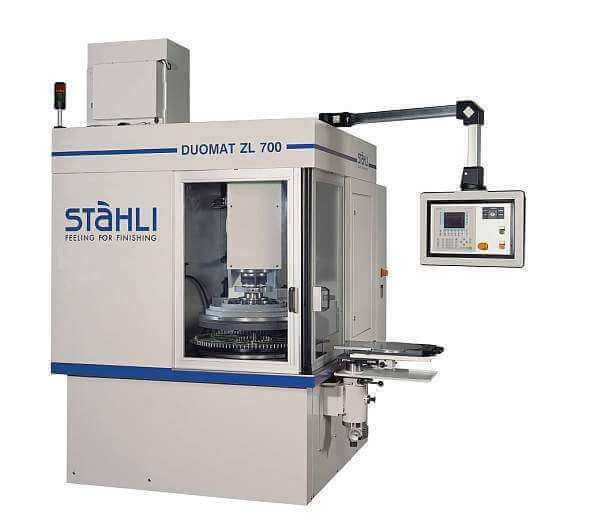 The Duomat series of the Stahli Group was adopted in the production program upon the takeover of the lapping-machine program of the former company Hahn & Kolb, Stuttart, and/or Bohner & Kohle GmbH (“boko”). 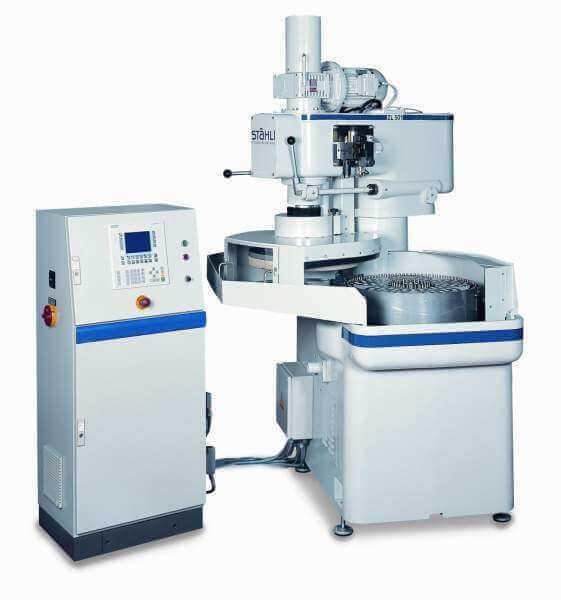 Several thousand editions of the machines by Hahn & Kolb were built and are operating worldwide to the complete satisfaction of the customers (Figures 12,13). This solid design ( cast housing) allows excellent performance on several materials. Thanks to modern valve technology, the hydraulics is extremely sensitive and makes it possible even to work on fragile work pieces. The feed of the upper working is carried out in the machine head. The large adjustment travel even permits the use of thick fixed-grains wheels. A hydraulic cylinder (X-axis) controls the lateral displacement of the machine head. The Z-axis has an integrated mechanical fall arrested, in case the power should fail. A power closed circuit cooling system is designed to cool the working wheels, the hydraulics and the lapping fluid. The integrated measurement control is regarded as the heart of all the series (DLM system) : it is extremely precise and responds to an accuracy of 0.1 micron. Work-piece tolerances of <2 microns are economically viable. An adjustable bar for the dimension sensor installed in the upper working wheel. The probe is mounted precisely by a rotating bearing (no rotation of the probe), and so the susceptible sliding contacts can be omitted as the connection to the meandering device and/or the machine control.